There is a lot to coordinate with any move. Even if you’re just moving a few blocks, you still have to let everyone know about your change of address. You have to put utilities in your name and schedule installation of cable. There are checks to change, credit reporting agencies to notify and all of that packing. It would be a huge task if you only had a weekend to move. Thankfully, most folks get 30 days between the time they turn in notice and when they have to actually vacate the premises. If you start the move countdown on the same day that you turn in your notice, then you’ll be ahead of the game. The best thing you can do with regard to your packing is to avoid packing old junk. This would be all the things you know you’re not going to use again or ever. It could be a lot of kitchen gadgets that are “overkill.” It might be a lot of clothes from your closet that you’re not into any more. There could also be all kinds of books, CDs, pots, dishes and furniture that you also don’t need at your new place. Why put all that on the moving truck? Instead, you should turn it over to Junk King Orlando. Junk King Orlando are a lot like movers. They have a team of workers who do all the lifting and loading. They like to pack up their truck with as much stuff in as little space as possible. The major difference is that when you give your junk to Junk King Orlando, it is going on a one-way trip away from you for good. That doesn’t mean the final destination will be a landfill. It could be a charity or recycling center. 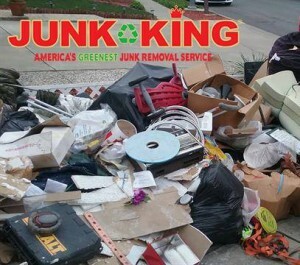 Junk King will make that determination and make the final drop off at no extra charge. With regard to that charge, it will be one fee that covers everything and that fee is based on the space you’ll fill on the truck. Remember how the crews like to pack stuff in tight? That means you get to pay the low end of the price scale. Sweet deal. Make a smart move by turning your old junk over to Junk King Orlando today. This entry was posted in Orlando Junk Removal and tagged clutter, junk king, junk removal, old junk on November 2, 2017 by Junk King. Last updated November 2, 2017 .